1) Getting approved for a BookBub, currently one of the most powerful promotional e-newsletters out there for discounted and free books. It’s competitive, so you may get rejected multiple times. Don’t give up. I was fortunate to get one last Friday, 2/10 for my Wars of the Roses Brides trilogy .99 sale. 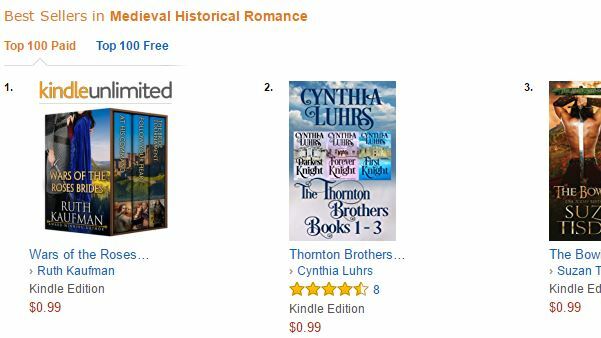 The trilogy zoomed to #1 in the smaller Ancient Worlds category, then #1 in the larger Medieval category, and even #1 in all Historical Romance. And, #48 in the entire Kindle ebook store. Not only that, but for a short while I was the #1 Historical Romance author, above even Diana Gabaldon of Outlander fame. Of course, sales have dropped precipitously. Yet six days later, it’s still in Medieval top 10. And Kindle Unlimited page reads continue. 2) Partnering with other authors, preferably those more famous than you. I’ve been fortunate to have been invited into multi-author boxed sets. Despite the proliferation of boxes with sometimes as many as 10 books for just .99, I’ve made more money than I would have on my own, and reached new readers. I was also invited to write a novella for Amazon All-Star Kathryn Le Veque’s Kindle World. This was time-consuming, but exposed my books to her vast readership. Also, group promotions such as giveaways, blog hops and Facebook parties can help. 3) My weak link but always mentioned as one of the best tools: Growinf your newsletter and filling it with interesting content. I keep meaning to work on this, but find the platform confusing, much less the administrative tasks of maintaining my list, watching open rates, etc. Another issue is consistency. It’s hard to and/or costly to sustain the visibility of major publicity, a big group event or a BookBub. What can you do? Write the next great book.